I. There is a possibility that some HCL are H20s. II. All KCL are NACLs. III. At least some HCL are NACLs. I. There is possibility that some SBIs are IBPSs. II. At least some LIC are IBPSs. III. Some SBIs are RBI. D.6-10) Study the following digit-letter-symbol sequence carefully and answer the questions given below. 5 @ E 2 7 A 3 Z # F ? 1 G 8 V 4 U T * B 9 $ S Y % 6 M J + H X ! 6. Which of the following is sixth to the left of eighteenth element from the left end ? If the first fifteen elements in the above sequence are written in reverse order, then which of the following will be twenty-first from the right end? How many symbols are there in the above arrangement each of which is immediately preceded by but not immediately followed by a letter of English alphabet? If the positions of @ and 2 are interchanged, so also the positions of # and ?, G and V and B and $ are interchanged, which of the following will be the ninth element to the left of eighteenth element from the left? M , L , N , X , R , A , J , K and Y are family members and there are four married couples in the family. J is the only son in law of K who is the mother of M. N is the paternal uncle of M who is unmarried male. K is the sister in law and daughter in law of N and X respectively. A is not a daughter of N but the granddaughter of Y who is the spouse of X who have only two child. R is a female. 11. How is Y related to X? How is sister of M related to brother of L? Which of the following group of members are resemble as a same gender? D.14-16) Study the following information carefully and answer the given questions below. Ram is facing north and he walked ten meters on his right side to reach point A. Again he walked five meters back side of point A to reach point B. He walked six meters from the north of point B to reach point C. On point C he takes a right turn and walked thirteen meters to reach point D. He takes a forty five degree on his right side and walked ten meters to reach point E. Point F is six meters west of point E.
14. Point F in which direction with respect to point A? What is the sum of the shortest distance between point D and Point F and the distance between A and B? Ram‘s starting point is in which direction with respect to Point F? D.17-20) Study the following information carefully and answer the given questions. 17. How is ‗small produced ban‘ written in the code language? What does ‘Zr’ stand for? What is the code for ‘Alcohol‘? Which of the following is the code for ‘pellet‘? D.21-25) Study the following information carefully and answer the following questions. Ten members A, B, C, D, E, P, Q, R, S and T are sitting in a two parallel rows. In row I persons A, B, C, D and E are sitting and facing south. In a row II P, Q, R, S and T are sitting and facing north. All the members are liked different colors viz Blue, Green, yellow, Red, Orange, White, Black, Brown, Pink and Violet. Q sits in the middle of the row. Only one person sits between Q and the person who likes Red color. A sits at the extreme end of the line and he neither likes Yellow nor Blue color. E sits second to the left of A. P is not an immediate neighbour of Q and also not facing A. Two persons sit between R and S who likes Orange color. C doesn‘t face the person T and S. B doesn‘t face the person T. The person who likes White color is in the middle of the person who likes Brown and Black color. The person who likes yellow color face the person who likes Red color. The persons who likes Blue and Green color are sit at the extreme end of the line. T doesn‘t like Violet color. 21. Which of the following person was likes Pink color? Which among the following person diagonally opposite to the person who likes yellow color? Who sits second to the right of the person who likes Black color? If D likes Brown color then who sits third to the left of the person who faces opposite to the person who likes Black color? If Q is related to the person who likes Green color and E related to the person who likes Red color then in a same way T is related to which of the following person? D. 26-30) Study the following information carefully and answer the given questions. A, B, D, J, Q, S and H live in a seven storeyed building. The lower most floor is numbered one and the top most floor is numbered seven. All the above information are not necessarily in the same order. i. P lives one of the floor above S.
ii. J doesn‘t live in a lowermost floor. iii. Only two person live between J and H.
iv. Only three person live between B and Q.
v. A lives immediately above B. 26. Who lives on topmost floor? How many person(s) live between S and the person who lives on seventh floor? If we arrange the persons in an alphabetical order from top to bottom then who occupies on floor number four? H is related to P in a same way S is related to A then how is A related to which of the following person in a same way? If P and S , J and B interchange their position with each other then who lives immediately above and immediately below Q respectively? D. 31-35) Study the following information carefully and answer the given questions. A, B, C, D, E, G, H and S are friends sitting in a circular table and some of them facing inside and some of them facing outside of the circle. No two person‘s facing same direction sit together. All the above information are not necessarily in the same order. i. Only three person sit between A and S.
ii. D sits second to the right of S. G and H are immediate neighbours of each other and either G or H is an immediate neighbour of A.
iii. E sits third to the right of G and not an immediate neighbour of A.
iv. H sits second to the left of C and B faces outside of the circle. 31. Who sits second to the right of the person who sits third to the left of the person C? Who sits exactly between E and H? Which of the following group of members are faces same direction? If H faces center then who sits third to the right of H? D.36-37) Refer the following table and answer the following questions accordingly. 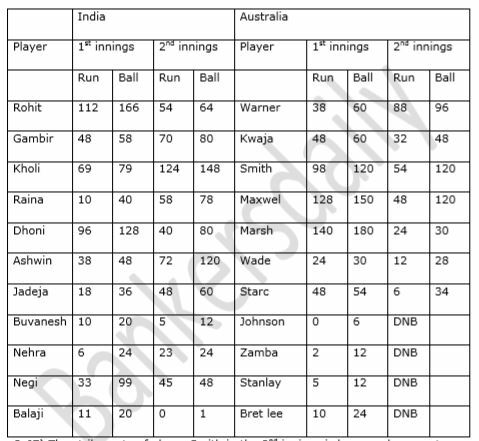 The table given below is a score card of a test match between two teams India and Australia. Q.36) what is the average runs scored by the players of India in the 1st innings? 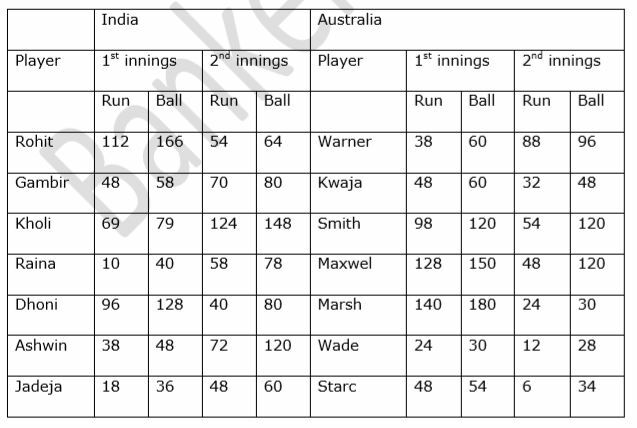 What is the ratio of total runs scored by players Kholi, Raina, Dhoni and Ashwin in 2nd innings to the total runs scored by Warner, Kwaja, Smith and Maxwel in the 2nd innings? D.38-39) Find the missing number and answer the following questions accordingly. Q.38) 48 50 94 294 1156 ? The sum of digits of a two digit number is 10. If 8 is added to the number, the result is a perfect square. How many such numbers exist? The average age of A and B is 23 years. If C would have replaced A, the average would have been 15 and if C would have replaced B, the average would have been 22 years. What are the ages of A, B and C respectively? 20 years, 16 years and 24 years. The sum of four numbers is 175. If we add 4 to the first number, 4 is subtracted from the second number, the third is multiplied by 4 and the fourth is divided by 4 , then the resultant of all the numbers are equal. What is the difference between the largest and the smallest of the original numbers? In the following questions, two equations numbered I and II are given. On solving them, we get value of X and Y in equation I and II respectively and choose the correct option. if x = y or relation cannot be established between 'x' and 'y'. D.45-47) Read the data carefully and answer the following questions. 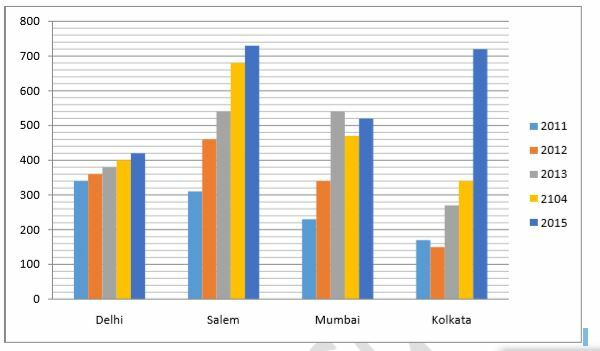 Below Bar graph shows number of aspirants appeared in Bank S0 exam from various cities during the years in hundreds. If 15% of total aspirants from all the cities taken together in 2013 are selected for interview which is 250% of actual vacancy then what are the total posts available during 2013? What is the approximate percentage increase in aspirants from 2012 to 2014 for all the cities together? What is the difference between the number of students appeared from Delhi and Kolkata during the given period (in hundreds)? 240 kg of an alloy A is mixed with 400 kg of alloy B to make a new alloy. If alloy A has lead and tin in the ratio 3 : 2 and alloy B has tin and copper in the ratio 1:4, then what will be the amount of tin in the new alloy? In the following question, two equations numbered I and II are given. On solving them, we get value of X and Y in equation I and II respectively and choose the correct option. An examination was conducted and 43% students failed in Hindi & 53% failed in English. 26% failed in both. Find the percentage of students passed in both. What would be the compound interest obtained on an amount of Rs. 6000 at the rate of 4% per annum after 2 years? 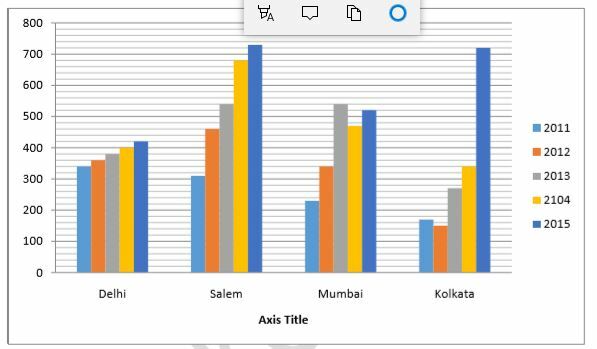 Below Bar graph shows number of aspirants appeared in Bank SO exam from various cities during the years in hundreds. If 45% of aspirants from 2015 are selected for mains and ratio of male to female aspirants selected is 2: 3 then what is the difference in the number of male and female aspirants being selected? What is the average of aspirants from Salem appeared during all the years taken together in hundreds? The ratio of the present age of Anupriya and her brother Harman is 2:3. After 7 years, the ratio of their ages will be 3:4. 7 years before , what was the respective ratio of their ages? Find the x value and answer the following question accordingly. 35 52.5 131.25 459.375 ? Refer the following table and answer the following questions accordingly. What is the percentage rise/fall of runs scored by player Dhoni from 1st innings to 2nd innings ? Find the x value and answer the following questions accordingly. A and B entered into a partnership by investing Rs. 25000 and Rs. 30000 respectively. After 4 months C also joined the business with an investment of Rs. 40000. What is the share of C If they obtained a total profit Rs.49000 at the end of the year? D.67-68) Refer the following table and answer the following questions accordingly. The strike rate of player Smith in the 2nd innings is how much percentage more or less than the strike rate of Maxwell in the 2nd innings (Strike rate is runs scored per 100 balls)? 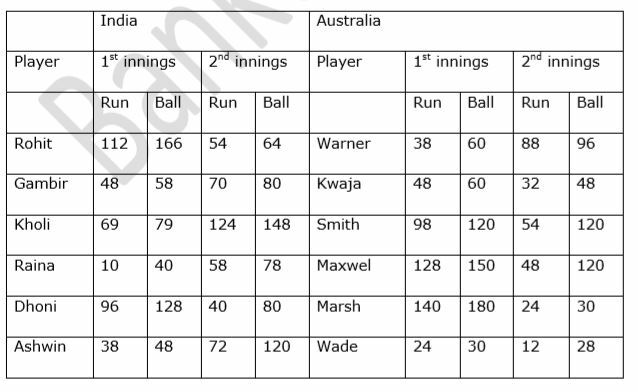 The runs scored by Starc, Johnson and Kwaja in 1st innings is what percentage of the total runs Scored by Smith in 1st innings (approximatey)? A man sells two cows for Rs. 18000. The cost price of the first is equal to the selling price of the second. The first cow is sold at a loss of 20% and the second at a gain of 25%. What is the total loss or gain in the entire process (in Rs)? In a one-day cricket match, the captain of one of the teams scored 49 more than the average runs scored by the remaining eight batsman of that team who batted in the match. If the total runs scored by all the batsman of that team was 382, then how many runs did the captain score? D.71-80): Read the following passage carefully and answer the questions given below it. Certain words/phrases are given in bold to help you locate them while answering some for the questions. You have probably heard of the great Pandava hero Arjuna. Here‘s a story about how he got the divine weapons that helped him win the great Mahabharata war. Locked in a bitter battle with their cousins the Kauravas, the Pandavas had to live in exile for 13 years. While his brothers and their wife lived in the forest, Arjuna — on the advice of the Pandava preceptor, Sage Dhaumya — decided to go to a remote area and propitiate the gods. After some time, Lord Indra appeared before him, and advised him to ask Lord Shiva for the Pasupata astra. Following Indra‘s counsel, Arjuna began to pray to Lord Shiva. As his penances became more severe, Shiva decided to test Arjuna before he gave him the weapon. When Parvati and Shiva‘s ganas knew that he was going down to earth, they decided to go with him and watch the fun. Disguised as a tribe of hunters, they went to the area where Arjuna was meditating. In the meantime, a demon named Muka was rampaging through the forest in the form of a wild boar. He had demolished an ashram and the terrorised sages were running helter-skelter. The noise from this disturbed Arjuna and he opened his eyes just as Muka arrived. Shiva and his followers reached the spot at the same time. As Muka tried to attack, both Shiva and Arjuna shot their arrows into the boar. The boar fell dead and the asura’s real form was revealed. Immediately, the hunters began to sing praises of their leader who had killed the asura. This annoyed Arjuna who thought he had been the one to kill it. After an argument, Arjuna challenged the leader to a fight, not knowing it was Shiva. First they shot arrows at each other. Arjuna‘s arrows, which had never missed the mark before, couldn‘t hit the hunter. When he found his quiver was empty, they fought with swords. All that happened was that Arjuna‘s blade broke. They moved on to close combat. When Arjuna tried to throw the hunter to the ground, he found himself lifted and thrown. An unnerved Arjuna, who was not used to losing, decided to pray to Shiva for strength. He called for a break and quickly built a little linga from mud and offered some flowers. Now feeling stronger, he turned to challenge the hunter again. What he saw stopped him in his tracks. The flowers he had offered the mud linga now sat on the hunter‘s head. He realised then that the god had been testing him and begged for his forgiveness. Pleased with Arjuna, Shiva and Parvati took on their divine forms and blessed him. Shiva also taught him the secret of the Pasupata weapon. Q.71) Lord Indra appeared before Arjuna and advised him to ask for Pasupata Astra from whom? What did Arjuna do when he was thrown during the fight? He did not call for a break. He built a little linga from mud. What was the demon named Muka doing at the forest in the form of a Wild boar? He terrorised the sages in the forest. Choose the word which is most similar in meaning to the given word, as used in the passage. Choose the word which is most opposite in meaning to the given word, as used in the passage. In the following passage, some of the words have been left out, each of which is indicated by a number. Find the suitable word from the options given against each number and fill up the blanks with appropriate words to make the paragraph meaningful. The elephant calf, the fawn, the bear cub and the infant chimp were friends. They lived in a forest near a river. One day, they______ (91) __ to play hide and seek. As they began to play, the elephant _____ (92) _____ that no matter where he hid his friends always found him. He was in fact always the first one to be found out. He became sad. Why did he have to be so big, he thought. He couldn‘t hide behind anything — tree or bush, nothing could ever cover him up fully. Either his tail would jut out or his trunk and sometimes his big floppy ears. He ___ (93) __ at the fawn — slim and trim, he just had to curl up behind a bush and you would not be able to find him till evening. Even the bear cub had it easy, he was so bushy! Actually if he would just bend down and ____ (94) _____ he could pass off for a brown bush. And the chimp – don‘t even mention him. The calf was so ____ (95) ___. Sadly, he sat down on the bank of the river. Tears _____ (96) ____ down his eyes and fell on the round pebbles. Suddenly a pebble moved. The pebble __ (97) __ its eyes and spoke, ―Hey, who are you? You look like an elephant to me. It is rare for an elephant to come and sit on the bank of the river.‖ The calf was puzzled to hear a pebble talk to him. ―Why are you ____ (98) ______ sad?‖ asked the pebble again. The calf told him his story. ―Hey, I know someone who can help you — my grandpa! He is big and wide and strong just like you. He is bigger than you in fact — he can easily cover you up. No one will ever be able to find you when you hide behind him. I am going to be just like my grandpa when I grow up‖, said Pebble ___ (99) ___. ―Will you take me to your Grandpa?‖ asked the calf. ―Of course,‖ said the pebble. ―Come along. Pick me up and put me on your back.‖And off they went. Grandpa was a big, giant of a rock. The calf had to look up and down and this way and that, to see his complete form. ―Wow! Your Grandpa is really big,‖ he said, ____ (100) ____ the pebble down.